As the saying goes, “it takes a village to raise a child,” but not necessarily a married couple. As the saying goes, “it takes a village to raise a child,” but not necessarily a married couple. In the U.S., the number of single-parent households is on the rise. In 1950, there were just 1.5 million single-parent families. As of 2017, that number climbed to 10.6 million and now represents a larger share of families with children under 18 than at nearly any other time in recent history. This long-term trend can be attributed to a variety of factors including higher rates of divorce, remarriage, and cohabitation. However, most notable is the order-of-magnitude increase in nonmarital childbearing, which now accounts for roughly 40 percent of births in the U.S. These statistics will likely come as a surprise to those who still cling to a more traditional view of family life. The reality is that the parents of today, whether or not by choice, are raising their children under an increasingly diverse—and often changing—set of circumstances. Across the country, single-parent households are more likely to face financial challenges than married-couple households. 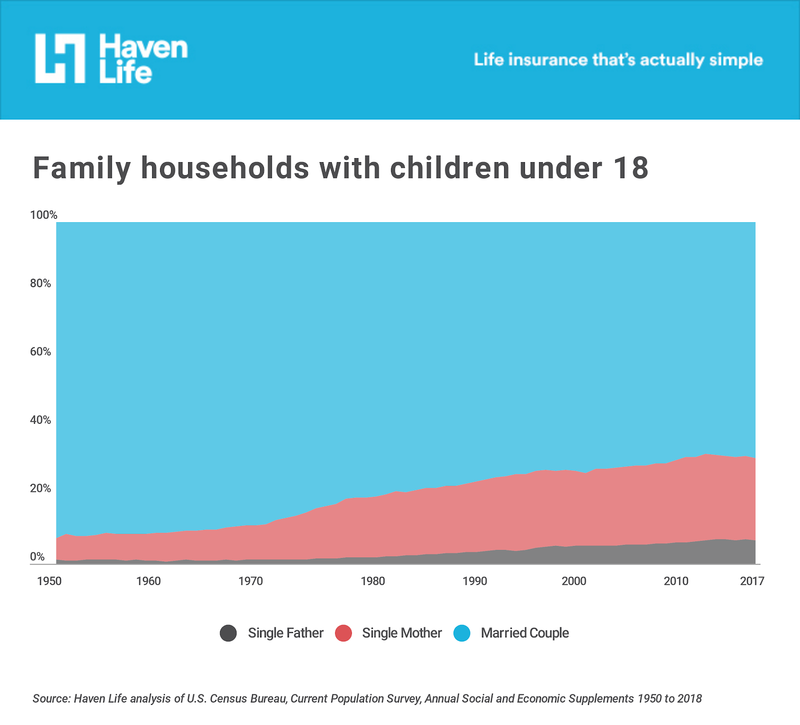 According to data from the U.S. Census Bureau, 31 percent of single-parent households with children fall below the poverty threshold, compared to less than 7 percent for married-couple households with children. Much of this is attributable to the fact that single parents only have one income to care for themselves and at least one other person. In addition, single parents often have more difficulty finding employment. The analysis revealed that approximately 8.6 percent of single parents are unemployed; this burden falls disproportionately on single mothers, 9.9 percent of whom are unemployed, compared to 4.8 percent among single fathers. By comparison, 97.6 percent of all married-couple families with children have at least one parent that is employed, meaning that just 2.4 percent of such households have no employment-based income from a parent. Race is a strong predictor of family structure in America, which is in part a reflection of socioeconomic differences that continue to persist. For example, 37 percent of Black or African American children under 18 are in married-couple family households compared to 85 percent of Asian children. In between are White (not Hispanic or Latino) children at 75 percent, Hispanic or Latino children at 61 percent, multiracial children also at 61 percent, and American Indian and Alaska Natives at 46 percent. At the city level, income, unemployment, and racial diversity are all associated with the presence of single-parent families as well. 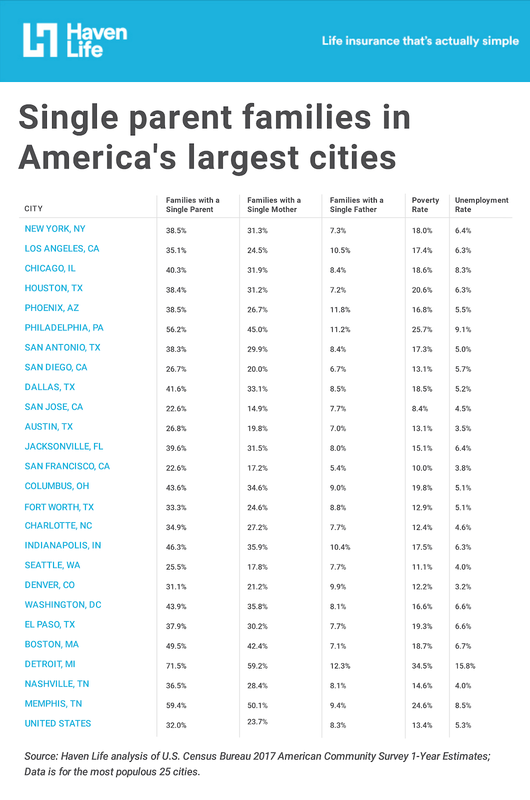 Across America’s largest 25 cities, the percent of family households with children under 18 that are headed by a single parent ranges from a high of 71.5 percent in Detroit to a low of 22.6 percent in San Francisco and San Jose, California. Beyond the obvious hurdles that one might expect to face as a lone parent, this data paints a more extensive portrait of the economic challenges common among many single-parent households. 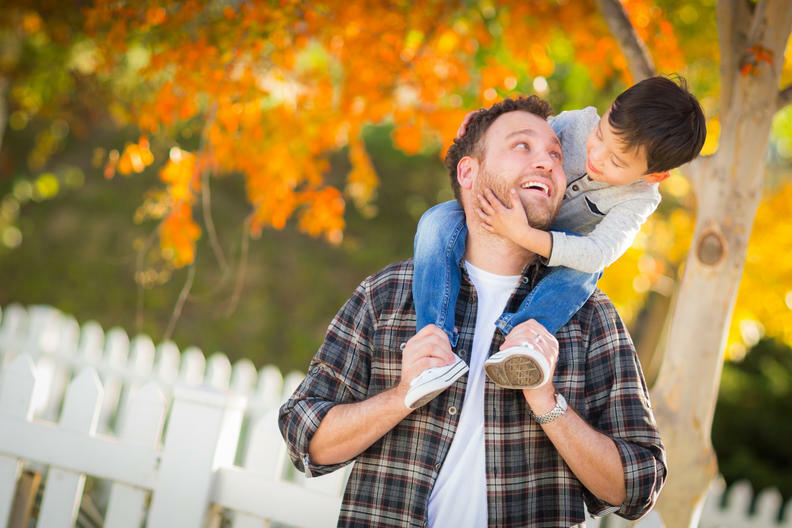 Between generally lower household incomes, higher unemployment rates, and fewer resources to handle everyday tasks, single parents can easily become stretched for both time and money. This is why it is even more important for single parents to create a financial plan for their family if possible. For inspiration and additional information, see Haven Life’s financial responsibility checklist for new parents. 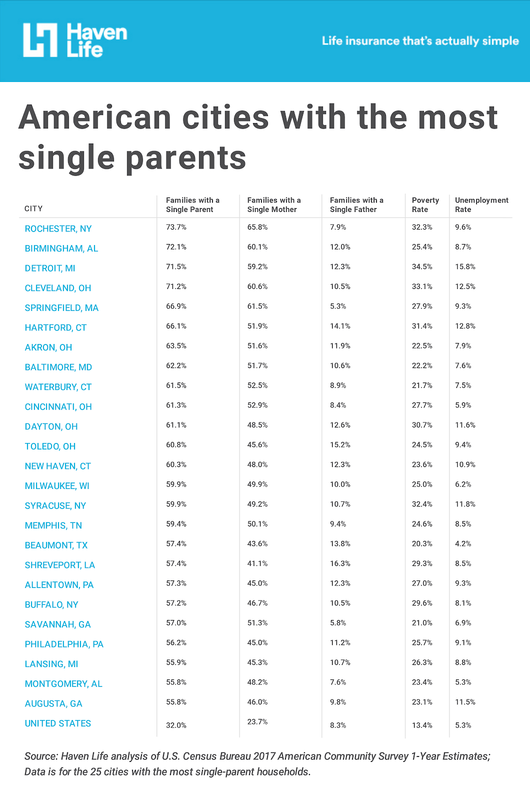 Family percentiles for single parents, single mothers and single fathers were derived from the 2017 American Community Survey 1-Year Estimates summary statistics. These percentiles were calculated as fractions of all families with children under the age of 18 for their respective cities. Statistics reported in the Takeaways section were computed from the raw sample weights of the PUMS dataset for the 2017 ACS 1-Year Estimates, unless otherwise noted. Only cities with more than 100,000 individuals were considered in the analysis.